The connection between a university graduation and social justice may not be immediately obvious, and I did not expect to be posting about my son’s ceremony, but a few things made the occasion somewhat relevant (at least for me, who connects pretty much everything to social justice). I was also struck (while standing outside somewhat bored) by the university’s banner and its reference to ‘Australia’s finest graduates’; I said something to my daughter along the lines of “that’s a bit arrogant, don’t you think?” Before she had a chance to speak, a young man next to me informed us that “we are ranked thirty-first [I think he said] in the world, you know”. 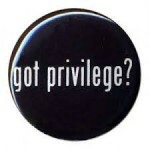 Amazingly privileged – again. The good part was that the professor who gave the occasional address reminded the assembled students, and everybody present, about the responsibility that goes with privilege. The theme of his talk was climate change; he regretted that his own generation had not done enough and encouraged the students to do better. My son does not talk about privilege and responsibility (leaving that to his mother) but he is committed to change, and did engineering to make a practical difference; he wants to work on renewable sources of energy. I do hope he gets that opportunity – and responsibility. Best Themis blessings to the generation of change…and hope… Joan Beckwith.